Cosmic Hurricane's pop'n music banner. A rock arrangement of Cosmic Hurricane, titled Cosmic Hurricane (GFDM ver. ), can be found in GuitarFreaksXG3 & DrumManiaXG3. The TAG BGM in REFLEC BEAT colette is based on Cosmic Hurricane. A remix of Cosmic Hurricane featuring vocals by DJ YOSHITAKA, titled Cosmic Hurricane -Try to Sing Ver.-, can be found in REFLEC BEAT colette -All Seasons-. Both Cosmic Hurricane and 紅焔 appeared on the first location tests of pop'n music Sunny Park and REFLEC BEAT colette. However, both songs did not appear when those games were released. Instead, Cosmic Hurricane and 紅焔 appeared on December 19th, 2012 as part of the Tsugidoka! (つぎドカ!) event. This makes Cosmic Hurricane and 紅焔 the only songs part of a cross-BEMANI game event to be revealed as early as the participating games' location tests. In the pop'n music Sunny Park location tests, Cosmic Hurricane's character was C-noid [20-1P]. 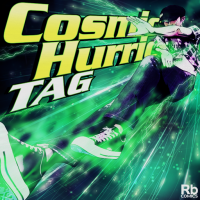 Cosmic Hurricane's CHALLENGE charts were added to DanceDanceRevolution X3 VS 2ndMIX on December 26th, 2012. Cosmic Hurricane received a brand-new set of charts in the final release of pop'n music Sunny Park. Like Diamond Dust and UNLIMITED FIRE, TAG himself appears on Cosmic Hurricane's jacket. Cosmic Hurricane is one of the bistro saucer 5th Set unlocks of jubeat saucer. It could be unlocked from February 1st to 28th, 2013. According to TAG, he initially had worries with the song name being Cosmic Hurricane due to not wanting to sound too similar to the song name Thunderbolt in terms of a song themed around wind. Ironically, TAG later wrote a song with "Thunderbolt" in the name itself, LIGHTNING THUNDERBOLT, from REFLEC BEAT groovin'!!. A 3P palette for FUGA is available by inputting the code found on the pop'n music Sunny Park original soundtrack vol.2 album. The code must be inputted at the final e-AMUSEMENT screen, where your already unlocked Secret Characters are shown. Cosmic Hurricane was shown to be revived in REFLEC BEAT 悠久のリフレシア on an in-game announcement on March 13th, 2019, despite the song not appearing in the game itself. The announcement was later removed.